I don't have a whole lot of energy today because - yippee - it's the first day of this month's Menstrual Party. But ya know what: it's cool. For the first one or two days I have a really sore lower back and will sporadically burst into tears when there's an uplifting background song playing in a radio commercial, but after that it's only about three more days of hardly noticing the flow and I am back to "normal". All together it's a necessary celebration of sorts, since it means I am healthy and fertile. Like some good soil. The whole point of me divulging that information was to illustrate that even though I am going through this bloody cycle today; I still made this cake. And THEREFORE, this cake is super easy to make. It's also raw, vegan, gluten-free, low in fat and high in fruit. Yay for life/fruit. This is my second instillation of my 3-part recipe series I'm gettin' done for the British Columbia Blueberry Council. They are an organization of different blueberry farmers in this province, and lots use organic practices. What you should know (besides a vague education about my PMS) is that blueberries from BC are the best. I already knew that but now you do too. ALSO: most of the high bush blueberries (the big plump ones) distributed throughout the whole world are from BC. We have prime real estate to make the juiciest high bush blue babes around. Get' em fresh right now if you live around the pacific north west, ooooooor find them frozen basically everywhere else, all year. Blueberries are super rich in cancer-fighting antioxidants and several studies have linked them to benefitting brain health. All that is great but at the end of the day I love them for their flavour. Juicy, sweet, slightly tart and always vibrantly coloured - blueberries are one of my top fave foods ever. About the recipe: it's really yummy. Essentially it's a smoothie in the form of an ice cream cake. If that concept makes it unappealing to you, forget I said it. 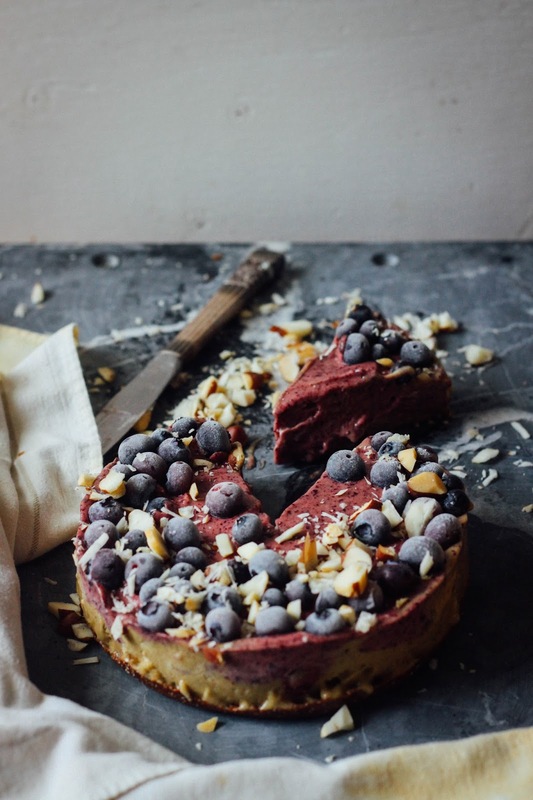 But if you are like me, a smoothie cake only sounds more enticing. We've got a chocolate crust followed by banana blueberry ice cream infused with fresh ginger aaaand vanilla. I topped it off with more blueberries plus some brazil nuts. Did ya know: eating a couple brazil nuts errday gives you all the selenium you need (for the day)? Plant power, man. To make the crust: grind the groats into flour in a high speed blender. Add the rest of the ingredients and blend (or use a food processor) until it comes together in a ball. Press into the bottom of a lined 6-inch springform pan. To make the ice cream: blend all the ingredients together until it gets to the consistency of soft serve ice cream. I like to scoop it out when there's still pieces of white and purple ice cream. It's more interesting to look at. Scoop this onto your crust and even it out with a spatula. 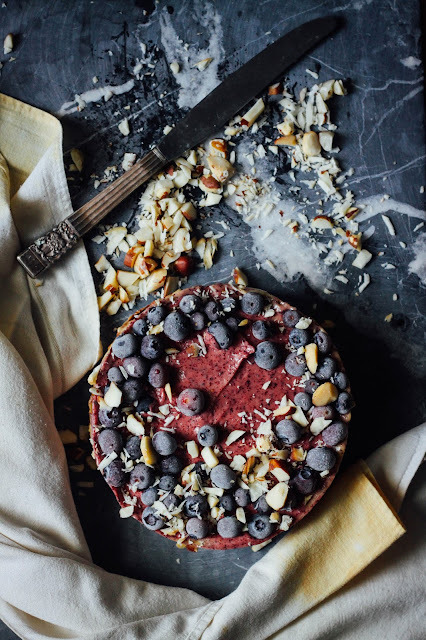 Decorate with some more blueberries plus brazil nuts and put in the freezer for 20-30 minutes until you can cut it. Cut it. Eat it. Nom. ADAPTIONS: use vanilla extract instead of vanilla bean pod; use coconut, seeds, nuts or oats instead of buckwheat groats; use cacao or cocoa instead of carob; use ginger powder instead of fresh ginger. This looks incredible! I love the addition of ginger - gives a nice warmth! All my smoothies are basically mushy icecreams anyways, since mah berries and bananas are frozen to obtain a spoonable smoothie (I like to 'eat' smoothies, is that strange?) AAAAANNNND I have the ingredients! Icecream cake weekend treats, YEAH BABY! This looks so good! Blueberry + Ginger is a good combo!!! I just bought a ton of blubs and put them in the freezer!! I wish I still lived where I could do You-Pick and load up on a big ol' bucket of them!! I didn't realize BC was such prime real estate for growing blueberries! That's awesome to have such an amazing abundance of produce in your area. And the way you used the bluebs in this cake.... ugh. It looks so. good. I've made nice cream before but I've never put it in a cake - that's so creative of you and I love it!! This looks beautiful and I bet it tastes amazing! How do you come up with your recipe ideas? Smoothie Cake!!!!! You've got me sold, right there. Hey Em! Just been getting into your blog. I'm a Canadian living in Australia and I'm seriously homesick for Vancouver Island where I lived for 4.5 years before moving here. I've been vegetarian for 10 years and have been considering going vegan. Looking at how beautiful your recipes are and how delicious your food sounds motivates me even more. This is the way I want to eat! Beautiful food. Thanks for the motivation. AMAZING! My sisters birthday is coming up soon, and I will definitely be making this! 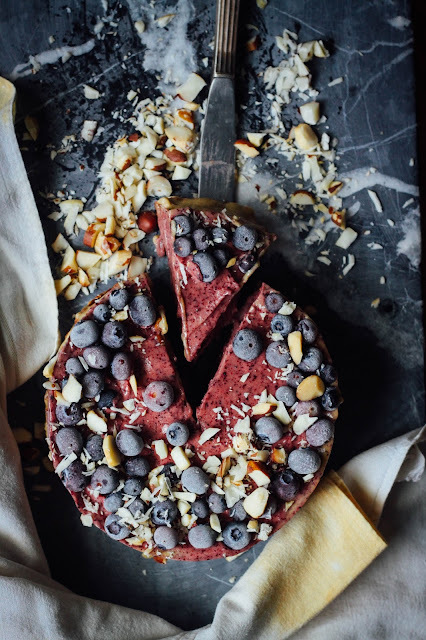 Who wouldn't like a smoothie cake?? A cake that heals the aching body, especially during a woman's cycle, is just the best idea! Tried this yesterday with mango instead of blueberries and made mini versions of it. It was by far the most delicious dessert I've ever had. I even dreamt about it last night haha! Thanks a lot for sharing your ideas and beautiful photos, it's inspiring. Keep up the great work!